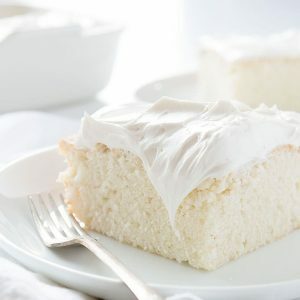 This Snack Cake is perfect for cravings… when you want to whip up a quick and delicious treat just for you and your loved ones to share. This Snack Cake with Caramel Frosting is as easy as it is satisfying! Preheat oven to 350°F. Prepare 8x8 square pan with butter and flour or baking spray. Beat butter at medium speed with a hand-held mixer until creamy, roughly 3-4 minutes. Sift together flour, corn starch, and baking powder; add to butter mixture alternately with milk mixture, beginning and ending with flour mixture. Beat at low speed just until blended after each addition. Beat eggs with a fork and then gently fold into batter. Pour batter into prepared pan. Bake at 350° for 35-38 minutes or until a wooden pick inserted in center comes out clean.